JingDong (aka JD.com) has been aggressively developing its drone capabilities ever since they first announced their intention to use delivery drones in October 2015. Earlier this year, they boldly announced plans to establish 150 operational sites for delivery drones in the province of Sichuan over a three year span. By June they had already conducted test flights. As of October, according to their recently released YouTube video, their delivery drones have logged in a total of 30,821 minutes in flight time, delivered 8,086 packages and flown a total of 10,242 km (6,364 mi). By comparison, Amazon (who was the first to amaze us back in 2013 with the whole delivery drone concept) seems to still be stuck in the testing stage. They only recently conducted their first proof-of-concept flight in Cambridge, England this past December. So what do China’s delivery drones look like? How will they be used and what does the future hold for them? The JD.com delivery drone fleet circa 2016. As of June 2017, JD.com had seven (7) different types of delivery drones in testing or operation across four provinces in China (Beijing, Sichuan, Shaanxi and Jiangsu). The drones are capable of delivering packages weighing between 5 to 30 kg (11 to 66 lbs) while flying up to 100 km/hr (62 mph). The drones do not deliver goods directly to people’s homes. Rather, they automatically fly along fixed routes from warehouses to special landing pads where one of JD.com’s 300,000 local contractors then deliver the packages to the customers’ doorsteps in the rural villages. The e-commerce giant is now working on a 1 metric ton (1,000 kg) delivery drone which will be tested in Shaanxi. The goal? Test the viability and profitability of carrying consumer goods to remote rural areas and then returning to urban warehouses with fresh farm produce (fruits, meats, and vegetables). It is expected that when fully developed, the planned drone delivery network in Shaanxi will cover a 300 kilometer (186 mile) radius and have multiple drone ports (“air bases”) to support its operations. Why 1 ton drones? Well, deliveries to infrastructure-challenged rural areas can cost delivery companies up to 6x more than a typical city trip. By flying over congested or non-existent roads in mountainous areas, the drones can improve delivery efficiency and save up to 70% in logistic costs. So what will this mega drone look like? A giant quadcopter? Not really. Most likely it will look like a bigger version of the VT1 model JD.com recently displayed at the Xi’an National Civil Aerospace Industrial Base. The 3.4 meter (11.1 feet) long VT1 can carry 200 kg (440 lbs) over 200 km (124 miles). Given the limitations of today’s batteries, it operates on a hybrid gas-electric engine. The JDrone is a collaboration between JD.com’s JD X Innovation Lab and Nvidia. So what is next for JD.com? At the moment, the company is very keen on acquiring top talent to help it design its sophisticated delivery drone network. Recently it offered a grand prize of 100 million yuan (US$15.1 million) to the winners of a competition to find the best solutions for conducting widespread drone delivery services across China. In addition, JD has partnered up with Nvidia to develop the JDrone, a high-performance delivery drone powered by Nvidia’s Jetson supercomputer thus enabling onboard AI-based decision-making capabilities. Due to airspace restrictions, however, it is unlikely one will see delivery drones flying over the Beijing landscape anytime soon. As such, there is a greater potential for JD.com in creating “heavy lift” drones to serve China’s rural areas. Not just to deliver food, medicine and e-commerce good but also as pesticide spraying machines or even for search and rescue operations. SF Express retrofitted a PAC P-750 XSTOL turboprop into an unmanned cargo drone. JD.com will definitely have to speed up its research and deployment timelines though. SF Express, China’s second-largest courier after China Post, recently converted a PAC P-750 XSTOL turboprop into a functional unmanned transport drone. The modified plane has a 1 ton (1,000 kg) payload and a flight range of 2,000 km (1,243 mi). It is expected this unmanned cargo drone will reduce operational costs by 30% compared to traditional planes with a pilot. Future models of SF Express’ converted turboprops are expected to be able to be capable of conducting an automated takeoff, cruising flight and landing with no manual manipulation whatsoever. An SF Express delivery drone prototype. SF Express has also received China’s first commercial drone permit from the People’s Liberation Army allowing it to fly inside a pilot zone in the city of Ganzhou in the Jiangxi province. 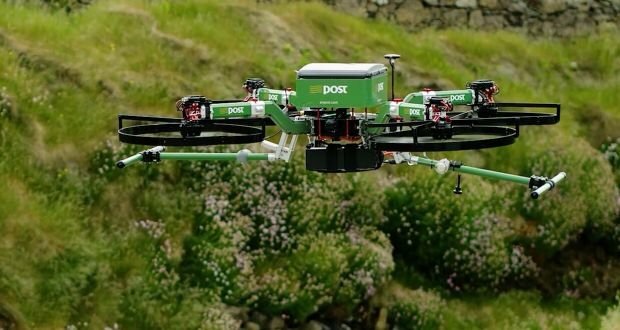 The area covered by the permit is 76% forested and 83% mountainous thus making it an ideal place to showcase the true value of delivery drones. The SF Express family of drones can carry packages weighing between 5 kg and 25 kg (11 lbs and 55 lbs). They can fly between 15 km (9.3 miles) to 100 kilometers (62 miles). As of July 2017, SF Express had obtained 151 drone-related patents. Who do you think will win the race to create China’s first profitable commercial delivery drone network? JD.com or SF Express?